Duncan Foord, Director of Oxford TEFL and tutor on our Trinity DipTESOL and Leadership in ELT teacher development courses, was guest speaker at the TED conference in Turkey on Saturday 14th May 2016. TED is a group of 38 English medium secondary schools in Turkey. Here, he explains his experience and offers the presentation as free download. The theme of the conference was “Surveying the landscape of CPD at TED”. In my plenary session I talked about how teachers can integrate CPD into their regular teaching lives. Conferences are great opportunities for teachers to take time to reflect on development options and draw inspiration from the talks and networking opportunities on offer, but the main work of CPD takes place over the year in the classroom and the staffroom as teachers collaborate with students and colleagues to improve the classroom experience and the quality of learning that takes place. We tried out some practical activities from my book The Developing Teacher for reflecting on ourselves as teachers, for gathering feedback from students, for preparing activities for the classroom and for conducting peer observations with colleagues. It was encouraging to see that the overwhelming majority of TED teachers are already observing and being observed in their schools. It seems to me that classroom observation has to be the cornerstone of any teacher development endeavour. How can we plan a journey without knowing where we are setting out from? Inviting a colleague into our classroom is vital in helping us to see how we are performing in the classroom and how the students are responding. We looked at alternatives to the traditional “sit at the back and take notes” type observation, which include joining the class as a “guest speaker”, a student and as a co-teacher. Somebody asked what I thought of having secret cameras in the classroom as a way to avoid the “observers paradox”, that is to say the idea that being observed tends to have a distracting effect on teachers and students. 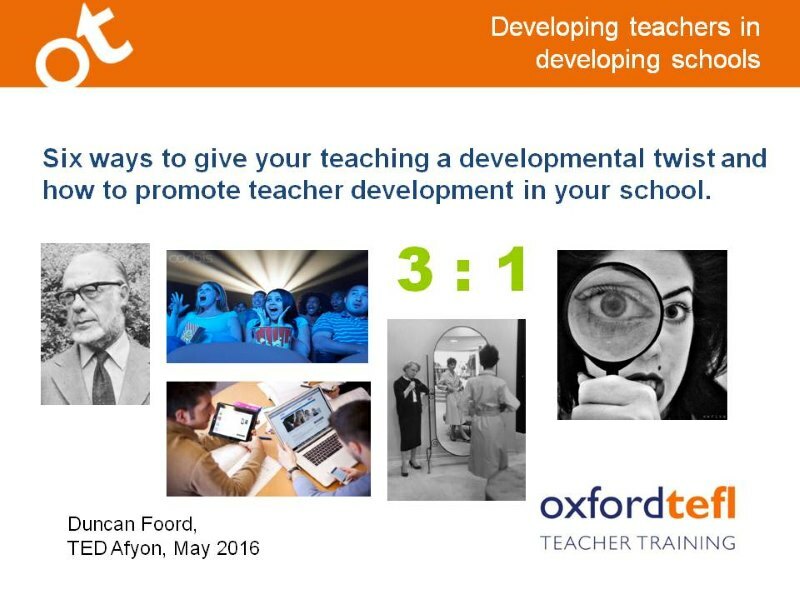 The question reminded me that I have experimented with secret video recordings of trainees on our Trinity Diploma in TESOL course. I record about a minute or two on my mobile phone discretely and afterwards tell the teacher what I have done and offer them the option to have me send them the video to watch and reflect on or delete it. This seems to overcome the ethical issues with secret recordings and hidden cameras in the ceiling, big brother style. In the final part of the talk we looked at how teachers can become coaches to themselves and each other by setting developmental goals, planning activities and revisiting these Development Plans, ideally with a colleague, to check what they have and haven’t done. This can be left to individual teachers or organized at a school level as a way motivate and measure CPD. A coaching approach is based on the premise that opportunities to develop our classroom teaching and our career in general are not lacking and not difficult to carry out. Where we usually fall short is in committing to specific outcomes and organising ourselves to make sure our best laid plans come to fruition. My thanks to everyone at TED for inviting me to speak at the conference, your warm hospitality and of course my crash course in useful Turkish phrases. Sag ol! Hop dedik! This entry was posted in Careers, Diploma, News, TEFL, TESOL by Rhys Bonney. Bookmark the permalink.